Both parties conducted lengthy site selection processes to determine which cities will host their conventions. Republicans started out with bids from eight cities, finally settling on Cleveland, OH. Democrats started with five possibilities, and opted for Philadelphia, PA. While Republicans' three most recent conventions have been held in late August and early September, RNC chairman Reince Priebus made clear throughout the process his intention of holding the 2016 convention earlier, even suggesting the possibility of late June. On Jan. 14, 2015 he announced the convention will be held July 18-21, 2016 (+). On Jan. 23, 2015 DNC chairman Debbie Wasserman Schultz announced the Democrats' convention will be held the week of July 25, 2016. Both conventions will thus occur before the Olympic Games, which will be held in Rio de Janiero from Aug. 5-21, 2016. Once the host cities has been selected, the respective convention committees start work on the details of how to meet housing, transportation, security needs of more than 40,000 people. Republicans have a Committee on Arrangements and Democrats have a Democratic National Convention Committee. Through 2012 the major party conventions had been funded in part by grants from the Presidential Election Campaign Fund (the $3 income tax check-off). The grants, set out in the Federal Election Campaign Act, started at $2.2 million back in 1976 and were increased a couple of times in addition to being adjusted for cost-of-living increases. To prepare their 2012 conventions, the Democrats and Republicans each received grants of about $17.7 million from the Treasury. Starting in 2016, as a result of H.R. 2019: Gabriella Miller Kids First Research Act, signed into law on April 3, 2014, the national party committees will no longer receive federal grants to help them put on their conventions. That left the question of how to make up for the lost funding. On Oct. 9, 2014 the FEC, responding to an Advisory Opinion Request (AOR) filed jointly by the DNC and RNC, ruled that the national party committees can establish convention committees that can raise federal funds under separate limits. The decision was met with disfavor by campaign finance watchdog groups (+). As important as the party convention committees are host committees. [11 CFR 9008.52]. These non-partisan, non-profit 501(c)(3) committees fulfill a range of functions. Early on they promote the city's bid. If the city is successful, the host committee sets to work raising money and in-kind contributions, recruiting volunteers and organizing events and activities to welcome delegates and media. Corporate contributions to host committees and "municipal funds" have comprised an increasing share of spending on conventions, leading for some to call for stricter regulations. The Campaign Finance Institute has argued that "policies of the Internal Revenue Service (IRS) and Federal Election Commission (FEC) on 'host committee' fundraising are seriously outmoded" and provide a loophole for tens of millions of dollars of "soft money contributions to party-produced extravaganzas." The Cleveland 2016 Host Committee had a $64 million budget. Due to the controversy over Trump, some corporate sponsors reduced their support compared to previous conventions or stayed away all together. By July 15 there were reports that the committee was short of its goal and seeking $6 million from billionaire Sheldon Adelson. Ultimately the committee reported total receipts off $67.4 million; and disbursements of $63.5 million. Recent Democratic and Republican conventions have been designated as National Special Security Events, meaning that the U.S. Secret Service takes the lead role in assuring the safety and security of convention-goers. The effort is complex and involves months of planning and dozens of entities and agencies. In 2016 the host cities of Cleveland (+) and Philadelphia (+) each received $49.9 million federal grants for security. 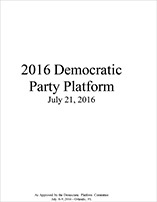 The platform outlines the party's philosophy and priorities and is prepared in advance of the convention. Truth be told, party platforms are not widely read documents, but the process of writing a platform affords the party the opportunity to publicly seek input from its various constituencies. 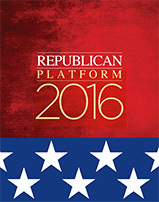 During platform discussions some points of contention do arise, such as the Republican Party's quadrennial battle over its abortion plank, but generally any major dissension is ironed out before the platform reaches the convention. In Cleveland there were dozens of counter events from marches and rallies to panel discussions and film screenings. One memorable event was Circle the City with Love; on July 17 thousands joined hands "in silent, peaceful reflection" across the Hope Memorial Bridge. On July 20 activists from a number of groups joined to create a canvas banner to "wall off Trump." CODEPINK even managed to get activists inside the hall to disrupt several of the speeches. Each convention city and venue poses a unique set of challenges and creates a distinctive atmosphere. Heading into the convention, the soon-to-be formally nominated candidate announces his (or her) vice presidential running mate and generally does some kind of tour hitting key states. Delegates arrive and activity begins. Being a delegate is an exhilarating but exhausting experience. A successful convention energizes attendees and activists, gets the message out to the broader public, and sends the ticket into the fall campaign with the convention bounce. For Republicans heading to Cleveland, there were still efforts to deny Trump the nomination; these played out in the Rules Committee on July 14 and then on the convention floor. Many prominent elected officials opted not to attend the Cleveland gathering. The convention was unique in the extensive use of Trump's family. Trump himself staged a grand entry on Wednesday, arriving in his jet at Burke Lakefront Airport and then flying in his helicopter to the Great Lakes Science Center where Gov. Mike Pence and his family joined him for an arrival ceremony. Overall, Cleveland and organizers did a good job preparing for the event, and most attendees had a positive experience, describing the city with such words as "friendly, nice, clean, and safe." Inside the Q, however, there was a dark tone, as many of the speakers attacked Clinton and portrayed a country in trouble. Polls nonetheless showed that Trump did achieve something of a convention bounce (>). Diversity was a major focus for organizers of the Democratic Convention. The DNCC reported that as of May 2016, 61% of DNCC staff were women and 56% of DNCC staff were diverse. The host committee spent 67% of contract needs with diverse owned businesses and 40% of its vendor pool was comprised of diverse businesses. As Democrats headed to Philadelphia there was tension between Clinton and Sanders supporters. The platform process diffused some of this, but Clinton's selection of Sen. Tim Kaine was seen as a setback. There was also the spectacle of DNC Chair Debbie Wasserman Schultz resigning on the eve of the convention following release of hacked DNC emails. Sanders supporters were particularly boisterous on the first night of the Convention, marked by dueling chants of "Hillary" and "Bernie." On Tuesday the roll call vote concluded with Sanders asking that Clinton be nominated by acclamation, but some Sanders supporters walked out and occupied the front of one of the media tents. Some Sanders delegates and activists vowed that they would never support Clinton; others acceded to the calls for unity. Following the convention Clinton and Kaine embarked on a three-day bus tour. The delegate experience in Philadelphia was rather different than Cleveland. In Cleveland the activity was concentrated in downtown; Philadelphia is a much larger city, and things were more spread out, including the necessity of getting out to the Wells Fargo Center south of downtown. Despite the tensions and difficult start, Clinton achieved a convention bounce as well. Following the Republican Convention in Cleveland, the Host Committee commissioned two analyses, using different methodologies, of the convention's economic impact on the region (+). The Maxine Goodman Levin College of Urban Affairs at Cleveland State University used a micro analysis based on questionnaires completed by visitors and estimated $67.8 million in direct spending and a total economic impact of $142.2 million in a seven-county region [PDF]. Tourism Economics used a macro analysis based on an economic impact model and found $110.1 million in direct spending and $188.4 million total economic impact on the region [PDF]. For the Democratic Convention, the Philadelphia Convention and Visitors Bureau reported direct convention-related spending of $132.9 million and total economic impact of $230.9 million [PDF]. H.R. 2019 - Gabriella Miller Kids First Research Act [House passed Dec. 11, 2013, Senate passed March 11, 2014, became law on April 3, 2014] -"Amends the Internal Revenue Code to terminate the entitlement of any major or minor political party to a payment from the Presidential Election Campaign Fund for a presidential nominating convention. Transfers amounts in each account maintained for such purpose for the national committee of a party to a 10-Year Pediatric Research Initiative Fund, making them available only for allocation to national research institutes and national centers through the Common Fund for making grants for pediatric research under this Act.